When did we get here, or has The X-Files always been like this? Mulder (David Duchovny) and Scully (Gillian Anderson) show up at a crime scene a reasonably proximal distance from Washington, D.C., refute all jurisdictional complaints care of whoever happens to have gotten to the scene first, make clear what their reputation entails when Scully notices something on the body missed by the original investigators (while Mulder lists a series of supernatural or conspiratorial anecdotes), more people die, the agents discover what’s going on but not without preventing the perpetrator from suffering a violent or painful death, everyone who would have died without Mulder and Scully there ends up dying with them there, the agents share a moment of introspection about aging and the paths their lives have taken, about what “it” all circuitously means in this, the Trump Era, and they leave, on to the next case they’ll barely crack to no evident effect. As The X-Files lumbers into what could be its final episode, the X-Files themselves seem more and more a relic of a government (a world) that no longer exists—or worse: that no longer matters. Mulder and Scully’s life’s work has become a budgeting anomaly, too inexpensive to raise a red flag within the bureaucratic bowels of the FBI, but too inconsequential to do much of substance anymore. In fact, with so much happening in this episode, Mulder and Scully are barely in it. Instead, Nielsen lays out whole episodes unto themselves, each necessarily underdeveloped because there’s only so much one can do in 45 minutes. The cult surrounding the underground organ harvest bows to ’60s sitcom actress Barbara Beaumont (Fiona Vroom), who, despite being a septuagenarian, looks exactly as she did on TV decades ago thanks to the cannibalistic “treatment” devised by her mad scientist husband, Dr. Luvenis (Jere Burns). The cult itself isn’t grounded with much of an explanation besides how those who belong to the cult, including Juliet’s sister, serve as living vessels for continuous blood transfusion or act as foot soldiers, finding victims for Barbara’s eventual consumption. According to some quick expository detective-ing on Mulder and Scully’s part, Barbara Beaumont left the public eye some 40 years earlier, hiding out on the top floor of a Bronx building she owns, using a system of tunnels and elevators and dumbwaiters to pay the building’s super and otherwise get what she needs. How does she recruit? Why would any person actually join this cult? How could they go 40-plus years basically keeping a group of young people living in such conditions, involved with murder regularly, without any law enforcement whatsoever showing up at her door? Rather than background or world-building, “Nothing Last Forever” provides some seriously stomach-churning prosthetic effects, making for the most upsettingly violent and grotesque The X-Files episode since the last one. Juliet, convinced God has called upon her to free her sister from the cult and repay all the damage to which her sister’s contributed, goes full-on Buffy, using the sharp ends of metal bars stolen from the cast-iron fence surrounding her church to slay bad guys like so many vampires. Her martial arts prowess seems formidable—she’s able to take down gun-toting heavies as well as nourishment-deprived cult members—but we never understand why that is, or from where her abilities stem. (A short scene of her training could have helped, at least.) Whether Mulder and Scully unintentionally led Juliet to Barbara Beaumont’s cult HQ or not, Juliet shows up and takes climactic action, killing everybody who you already assumed would die, a surprise massacre which also saves her sister’s life when, most likely, Mulder wouldn’t have been able to. Similar to the end of The Passion of Joan of Arc or to the part where the Boondock Saints drop a toilet on a guys’ head, Juliet’s admission of her tenuous legal standing does not account for all the superheroic things she was able to accomplish. Mulder and Scully don’t follow up on this line of questioning, though Juliet is arguably an X-File all on her own. Ostensibly, the season’s penultimate episode gives Mulder the chance to say, “I always wondered how this would end,” when Scully whispers into his ear what she really wants out of this life they’ve built together, whatever term you want to use to describe it. It looks as if she mouths the word “William,” the Chekhov’s gun of the season, who will undoubtedly make an appearance in the finale, shooting off his brain powers to confirm that this whole season occurs in an alternate dimension from Season 10, or that Season 10 was all a dream, or that Mulder and Scully have been plugged into the computer database described in “This” and so have been living out the archetypal X-Files episode these past couple months, or something along those lines. That Mulder and Scully have been living in an all-encompassing simulacrum since the world-ending catastrophe of “My Struggle II” could at the very least explain why this season has so often felt like a simulacrum of a much better television series. 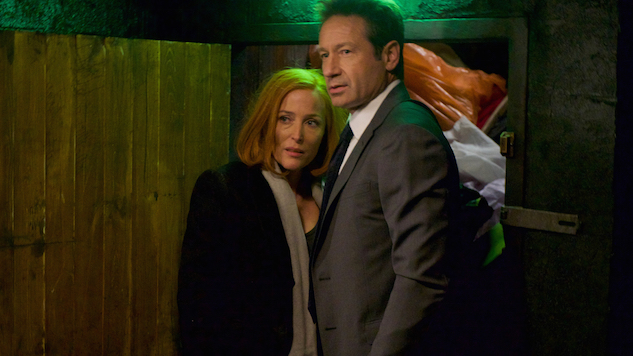 Leveraging familiarity among fans, characters and even the crew putting these episodes together—admirably bringing former actors and script supervisors and assistant directors from the series’ past two decades into bigger roles—The X-Files now relies less on interrogating Fox Mulder and Dana Scully as human beings progressing through time, than on stating many of the same obvious insights about what “rebooting” means more than 15 years after the show was at its popular and creative zenith, which is what it already did last season. Perhaps The X-Files has always been this way, Mulder and Scully simply surviving, not affecting, the many ordeals within which all they can do is struggle to find meaning in a universe practically bloated with meaninglessness. Looking back, this may’ve always been the case: The alien colonization, the government’s conspiracies, the mass plague that may or may not have actually happened, the deaths of loved ones, the Truth. Whether or not any of it’s out there, it all happened despite Mulder and Scully’s best efforts, despite the sacrifices made by so many to reveal the truth, even though no revelation could actually stop any of it from coming to fruition. Which could be Chris Carter’s ultimate point: It doesn’t matter whether the truth is out there or not. The truth has abandoned us. Dom Sinacola is Associate Movies Editor at Paste and a Portland-based writer. He’s been to at least one X-Files convention. You can follow him on Twitter.